Situational awareness: "North Korea said it would ... potentially destroy its primary nuclear complex if the United States agrees to corresponding measures, South Korean President Moon Jae-in announced in a joint press conference with Kim Jong Un," per CNN. "The era of no war has started," said Moon. "This is the ugliest situation imaginable," said a source close to Senate Republican leaders. Could the call for an FBI probe cause a delay that allows other issues around Kavanaugh to ignite? Could Sen. Jeff Flake (R-Ariz.) use his leverage here as payback for past clashes with President Trump? Will suburban women feel further distanced from a party with mostly male leaders, who are seen as protecting a man? Could this episode trigger a presidential-like midterm election where issues like Roe v. Wade, the courts and the rights of women come to the fore? Sen. Bob Corker (R-Tenn.) tweeted: "Republicans extended a hand in good faith. If we don’t hear from both sides on Monday [in public or private], let’s vote." But we're told that McConnell believes that he will have the 50 votes needed to confirm Kavanaugh (with Vice President Pence breaking a tie, if needed). Republicans say they still would be happy for Ford to testify at the Senate Judiciary Committee hearing scheduled for Monday. But they hope to resist demands for a further delay by Democrats and the accuser. A letter to the committee last night from Ford's lawyers, Debra Katz and Lisa Banks, said: "A full investigation by law enforcement officials will ensure that the crucial facts and witnesses in this matter are assessed in a non-partisan manner." Hillary Clinton, marking yesterday's publication of the paperback edition of her memoir "What Happened," told Rachel Maddow on MSNBC: "They could postpone for two weeks, and probably get a lot more information than they have now. ... I think the White House and the Republicans on the committee are trying to ... basically put her in the dock and try to rush this through." But a top Republican source told me that leaders view Ford's account as "not only unproven, but unprovable," and will not take the risk of an extended "pause." "They could investigate for a hundred years," the source said. "McConnell is not going to let that happen. He doesn't think Brett's life should be demolished by something she's not willing to testify to." Worthy of your time ... Anita Hill writes an op-ed for the N.Y. Times, "How to Get the Kavanaugh Hearings Right." P.S. First look: John Legend stars in a new digital ad, produced by the NAACP Legal Defense and Educational Fund and promoted with other progressive groups, urging viewers to tell their senators to vote "no" on Kavanaugh. YouTube: See another new ad from the progressive Demand Justice. Remember when the tax cut was going to be the issue that saved the GOP majority? That strategy died in March, when the special election won by Rep. Conor Lamb (D-Pa.) showed that the issue wasn't working for Republicans. The Real Clear Politics polling average for Trump and Republicans' tax reform law is 39% approve, 42% disapprove. "In their quest to regain the majority in the U.S. House, Democrats are focusing on the potential for the new Republican tax law to hurt certain voters in high-tax states such as California, New Jersey and New York." A majority of Americans believe Bob Woodward's "Fear" and the anonymous N.Y. Times op-ed, both of which report internal resistance to President Trump, according to a new Axios/SurveyMonkey poll. But there's no evidence that either has changed Americans' opinions of him. Why it matters, per Axios' Alexi McCammond: If two bombshells warning of White House chaos don't change things, it's further evidence that Americans' opinions of Trump are set in stone. P.S. Simon & Schuster announced that "Fear" sold more than 1.1 million copies through Week 1. "Fear" joins Michael Wolff's "Fire and Fury" as a million-selling portrait of a chaotic Trump administration. Wolff's global sales are more than 2 million. "I don't think my approach differs from my older peers. 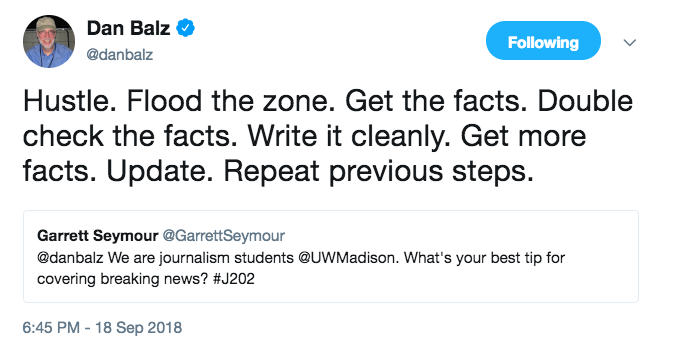 I probably have more in common with them than I do with the new generation of reporters, who are much better with technology than I am." "I learned shorthand and trained as a reporter in a very traditional way back in Australia at the Sydney Morning Herald. Before I went into political reporting I used to cover anything from music festivals to local government to murders and police stories." "The approach is the same: Check, check, double check, triple check. Make another phone call. Make another phone call. Be constantly petrified that you're going to bring shame on yourself and your family." "U.S. employers are boosting benefits — including bonuses [paid leave] and vacation time — at a faster pace than salaries," The Wall Street Journal's Te-Ping Chen and Eric Morath report (subscription). "The trend extends a long-running but slow shift in compensation toward benefits and away from baseline salaries." Why it matters: "[T]hat gives them more flexibility to dial back that compensation if the economy turns sour." Outgoing Chicago Mayor Rahm Emanuel is writing a book to be published by Alfred A. Knopf in spring 2020: "The Nation City: Why Mayors Run the World," about effective governing in a time of historic gridlock. 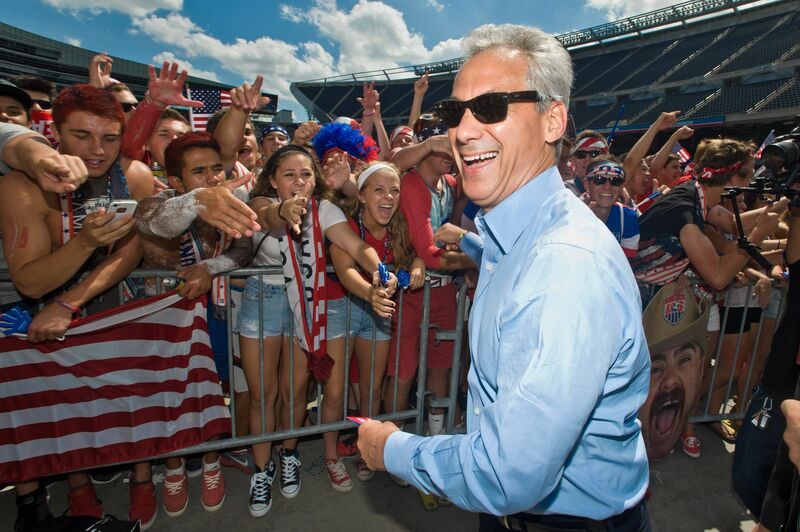 Emanuel, 58 — a former White House chief of staff and House Democratic leader — chatted with us yesterday as he strolled toward City Hall, pausing now and then to shout: "Hey, man! How are you, brother?" On the weakness of political structures and the speed of technology: "The public is reacting to that uncertainty and creating, in a bizarre way, even more uncertainty." "National governments, whether here or in Europe, haven't responded." "The most stable political entity we have is local government ... We don’t have the luxury of waiting." In past decades, "mayors would go to Washington and say: 'Save us.' Today, we go to Washington and say, 'We're going to save you.'" Emanuel said issues on which he and other mayors are acting locally include immigration (scholarships for Dreamers), making higher ed more affordable, infrastructure, minimum wage, income inequality and sustainable environmental policies. Emanuel has jammed days, including swimming at 5:30 a.m., but has begun work on the book by taking notes and talking to counterparts around the globe. WashPost A1, "Paradox 2018: Angry voters want less anger." "He has me shining Chuck Schumer’s shoes and doing Nancy Pelosi’s hair." 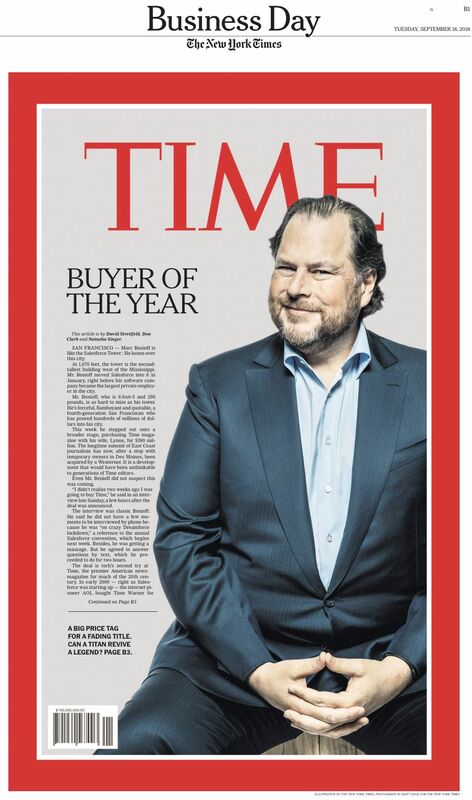 The N.Y. Times gave us permission to share with Axios AM readers the cover of yesterday's business section, devoted solely to a behind-the-scenes account of the purchase of TIME by Salesforce's Marc Benioff and his wife, Lynne, for $190 million. The story includes two hours of texting while the mogul gets a massage. 9. 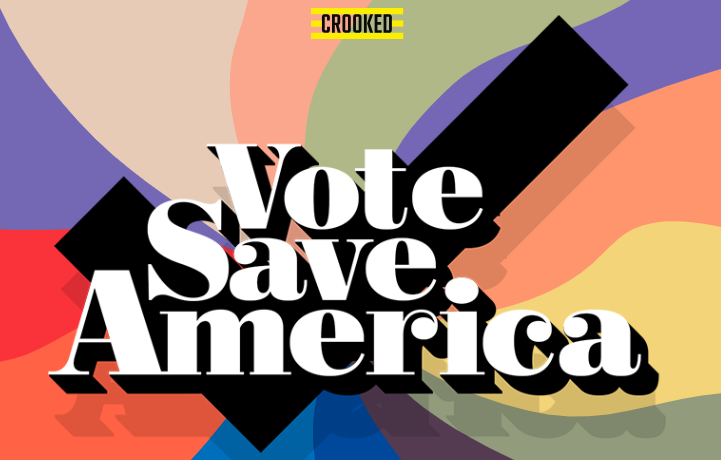 "One-stop shop for democracy"
Crooked Media and the smash "Pod Save America" podcast have built Vote Save America, which lets you check to see if you're registered to vote, register, pledge to vote, and find volunteer opportunities in your area. Eventually, you'll be able to get a sample ballot with information in plain English about local races, ballot initiatives, etc. Co-founder Tommy Vietor tells me: "We're trying to help young people understand that voting is easy, you don't have to be intimidated by the process, and that your vote makes a difference." The site went live yesterday with this video. "Invented in the 1950s, ranch is now far and away the most popular salad dressing in the country, according to a 2017 study by the Association for Dressings and Sauces ... (Forty percent of Americans named ranch as their favorite dressing; its nearest competitor, Italian, came in at 10 percent.)" "And it has spread far beyond salad. It is a routine dip for chicken wings, baby carrots, French fries, tortilla chips and mozzarella sticks. ... And it is drizzled over tacos, Tater Tots, casseroles and — perhaps most controversially — pizza." "Unlike, say, Green Goddess or Thousand Island, ranch dressing has inspired fandom beyond food: Sightings include bottles of ranch-flavored soda, ranch fountains at parties, ranch tattoos and memes ... It stars in countless videos posted on YouTube by ranch superfans, who pour it on ... ramen, ice cream." If you have to ask: "It’s a combination of creaminess (from buttermilk, sour cream, sometimes mayonnaise) and herbaceousness (often parsley, thyme, dill), plus a long pull of allium (onion and garlic) and a shot of black pepper."